There's something wonderfully comforting about having warm lasagna, on a plate balanced on your knee in front of the television. Sinking your fork through layers of pasta, savoury meaty tomato filling and a creamy white sauce. Can anything else be described as heavenly? Since our fridge ran out of mince, I dug into our permanent stash of sausages instead for a chunkier meat sauce and got lazy with making my own tomato base, but switch the pre-prepared bolognese sauce with a can of tomato puree and sprinkle of oregano, basil, thyme and rosemary if you have the time to make it. Brown the onions in a large enough saucepan. Add the chopped ingredients and sauce to bring to a boil, before left to simmer for 10 mins. This is a good time to start the bechamel sauce. Melt butter in a medium saucepan over medium-high heat until foaming. Add flour. Cook, stirring, for 1 to 2 minutes or until bubbling. Remove from heat. Slowly add milk, whisking constantly, until mixture is smooth. Return to heat. Cook, stirring for 10 to 12 minutes or until sauce comes to the boil, thickens. Remove from heat. Stir in cheese and nutmeg. Now the truely fun bit - assembly. I used to try piling lasagnas 4 layers high, but with the chunky meat sauce, don't attempt this with more than 2. It just won't hold its shape well enough (and my dish just isn't that deep anyway). 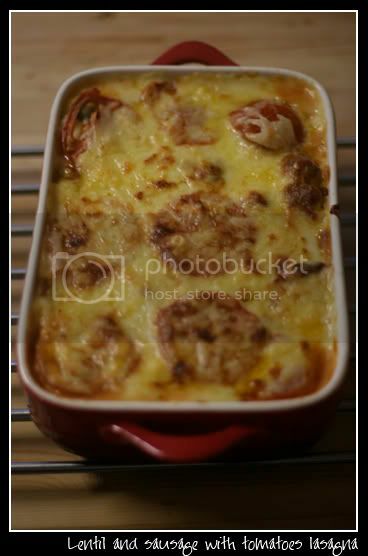 Start with a layer of meat sauce at the bottom, layer the uncooked lasagna sheets and pour some bechamel sauce over. Spread as evenly as possible before arranging the sliced tomatoes. Repeat and top with more grated cheese (breadcrumbs would add more crunch and is optional). Bake in a 170ºC oven until brown. Of course, you just had to post this while I'm wrestling with a craving for (preferably unhealthy) Foods with Cheese. *g* It looks/sounds delicious! It is, especially when you're just too lazy to go out and get proper ingredients for traditional lasagna. *miserable sniff* (;_;) I haven't had lasagna in the longest time. This looks and sounds so tasty that I am sadded it didn't happen in my own kitchen. I would love that and I'll definitely do the same - if you don't mind the drive out into the sticks to get to my abode! Since Azzy hates ricotta cheese, I might want to try this version. I reckon you can use just about any cheese, save mozarella for bechamel sauce. If I wasn't already fed tonight, I'd totally drool.